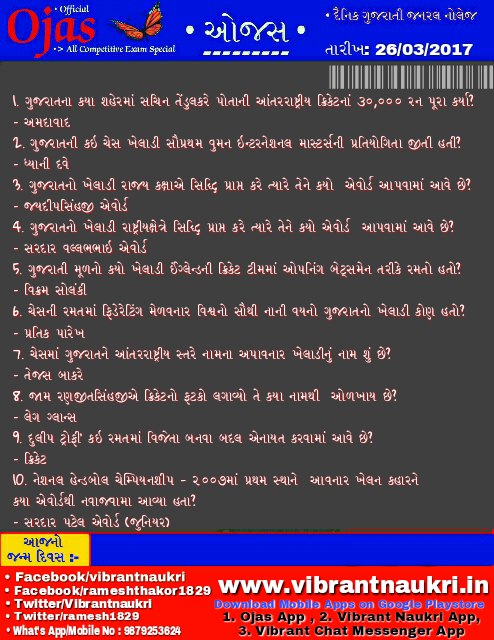 Ojas Daily Gujarati General Knowledge Page on 26/03/2017: We are republished our official Ojas GK daily page Ojas GK is a daily published very use full Gujarati General Knowledge for all competitive exams preparation. Like a GPSC, GSSSB, GPSSB, TET,TET2,TAT,HTAT,Clerk,Police, PSI, ASI, RAILWAY, TALATI etc. More information please read below mention details carefully..